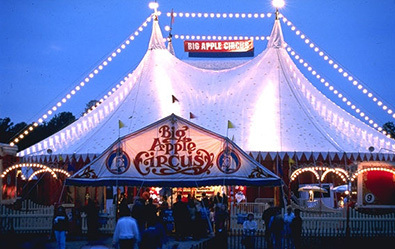 The Big Apple Circus was founded by Paul Binder '63 in 1977. It won't be a Big Top, but Paul Binder '63, founder and former artistic director of the Big Apple Circus, will be back under a tent and in the spotlight as he emcees his 50th class reunion dinner on Saturday, June 8. A week later, Binder will return to campus to introduce acts from the Big Apple Circus which will be performing for thousands of alumni during the Reunion "On the Green!" event. "I can't get enough of the place," he says of Dartmouth. "What a blessing to have it be a part of my life." 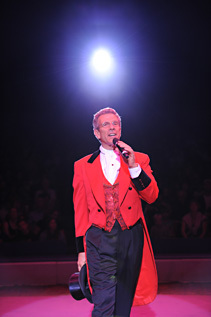 In turn, Binder has been a part of the lives of many fans of the circus. In small towns and in cities, literally millions of people in the country watched him serve as the ringmaster of his intimate, one-ring circus. Those who didn't see him in person in those 32 years may have seen him as the juggler on Sesame Street from 1977 to 1984 or in national media coverage. He was described as "a fast-talking six-footer with a carny barker's lung power" in a 1993 New York Times profile and when ABC News named him its person of the week in 2008 they said the Big Apple "revolutionized the circuses in America." A self-described "provincial kid from Brooklyn," Binder credits his unorthodox career path to Dartmouth, where he says his classmates, the opening of the Hopkins Center for the Arts, and his teachers inspired him, especially the late professor of history John Williams. "At Dartmouth I was essentially told 'hey you can be what you want to be,'" he says. "You don't have to be a doctor or a lawyer or a merchant chief. You can do other things. We had the sense that every one of us can create wonderful things in this world. That's what Dartmouth gave me." Paul Binder '63, founder and former artistic director of the Big Apple Circus. Of the Hopkins Center, Binder says, "The emphasis on the arts and the belief that was being expressed about the arts at the time just turned me on. I was a kid who saved his nickels to go to a Broadway show. Here was this notion that you could go to college and at the same time follow this dream idea of what you’d like to do with your life. The belief that you could inspire people through the arts, and be inspired by them, it was a powerful message and a powerful place." After graduating with a degree in history, Binder worked for seven years (one of his jobs was as a floor manager for Julia Child's television show "The French Chef") and he received his degree in business from Columbia. Then in 1970 he made a career change by joining a mime troupe in San Francisco where he met his future juggling partner Michael Christensen. Together they juggled on street corners in Europe and were eventually hired by the Nouveau Cirque de Paris in France. Binder says, "When I witnessed the European version of what we call a circus it just fit every notion of what it meant to bring community together, to bring people together around pleasure and joy." When asked if he ever had any doubts in those early years, Binder said, "Are you kidding me? All the time! I just understood I was doing something that gave people enormous amounts of pleasure. I was following my bliss, and what made sense to me. And Dartmouth had taught me how to learn, so I could be confident that I had that tool." Binder will visit Dartmouth for the third time later this summer to sign his book Never Quote the Weather to a Sea Lion at the Dartmouth bookstore. At the invitation of the Avalon Foundation Chair of the Humanities Peter Hackett '75, Binder will also serve as a guest lecturer for a day in a class taught by Jamie Horton, associate professor of theater. Binder says, "There’s nothing more thrilling than teaching in a classroom that you were a student in at Dartmouth. It’s like 'Whoa, mom, look at me now.'"